Heal psychological wounds on your own. Move on from the emotional trauma of your past: Contrary to what many people believe, we can recover from emotional trauma relatively quickly and completely on our own. Whether it's extreme trauma such as sexual abuse or the horrors of war, or less dramatic but, psychologically speaking, just as serious wounds involving shame and guilt, we don't need to spend years in intensive therapy to recover. Keep Pain in the Past explains a process that allows you to do most, if not all, of the recovery on your own. Train yourself in psychological self-healing: While most people know what they can do on their own to treat physical ills, they don't realize that they can apply certain psychological principles to treat anxiety, depression, and many other conditions. Keep Pain in the Past will teach you the critical skill of treating psychological wounds on your own. Treat yourself and heal old wounds: As much as people may suspect that some trauma from their past is affecting them negatively, they struggle to do anything about it. They take refuge in denial, avoidance, or addictions rather than grapple with long-ago emotional pain-because surfacing that pain hurts. Keep Pain in the Past will help you identify and face this pain and find closure on your own. 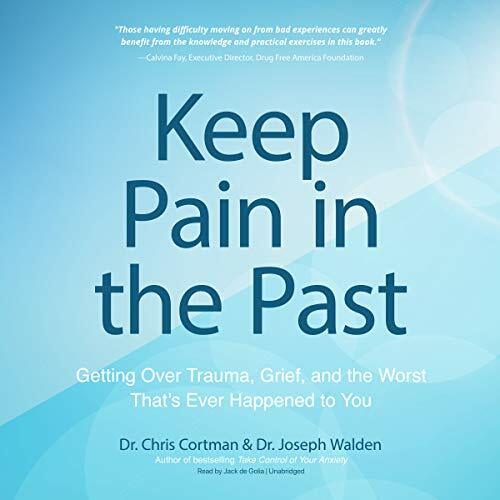 Use Dr. Chris Cortman's easy-to-master method to remember, feel, express, release, and reframe the trauma that has been haunting you for years. Learn from the success of others: Discover how Sheri, a 37-year-old attorney, recovered from panic attacks that seemed to come out of nowhere. Follow the journey of Mark, a 29-year-old army veteran who experienced the horror of war in Afghanistan. Explore how Melinda, a 42-year-old professor who struggled to sustain a romantic relationship, confronted her torturous childhood and found love that is still going strong after three years.